President Obama delivered a major speech on energy at Georgetown University on Wednesday, during which he said: "We’ve also made historic investments in high-speed rail and mass transit, because part of making our transportation sector cleaner and more efficient involves offering all Americans, whether they are urban, suburban, or rural, the choice to be mobile without having to get in a car and pay for gas." 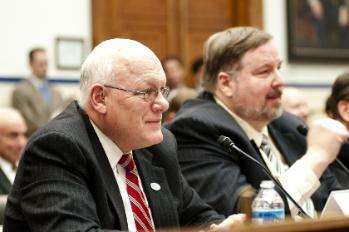 The House Transportation & Infrastructure Committee's Subcommittee on Highways and Transit, chaired by John J. Duncan Jr. (R-TN), held two hearings on surface transportation authorization this week, with 40 witnesses testifying, including APTA President William Millar. Millar urged Congress to increase federal investment in public transportation and detailed ways for Congress to more efficiently target investments to improve and expand America’s public transit systems. He called on leaders in Congress to promote growth and innovation in public transit, especially by passing a well-funded six-year multimodal surface transportation bill. Also, the House Appropriations Committee began hearings on the Fiscal Year 2012 transportation budget request, with DOT Secretary Ray LaHood testifying Tuesday morning on the entire agency budget. APTA President William Millar testifies before the House Transportation & Infrastructure Subcommittee on Highways and Transit. At right is Larry Hanley, international president of the Amalgamated Transit Union. DOT Secretary Ray LaHood recently announced that construction of high-speed rail on the DesertXpress corridor between Las Vegas and Southern California will soon get underway. The project cleared a major hurdle last week when the Federal Railroad Administration released its final environmental impact statement. While high-speed rail means much shorter trips from California to Las Vegas, it also, according to LaHood, "means jobs, and it means reinvigorated American manufacturing." APTA’s Presidential Selection Task Force released the job description for the next APTA president and initiated the recruiting phase of its efforts this week. The final job description has been posted to the Presidential Search Task Force’s information page. Potential candidates may access the job description there and contact Gregg Moser of Krauthamer and Associates at (301) 654-7533. The task force has asked that all inquiries be directed to Moser. The task force -- using an open, transparent process -- developed this job description from the compiled list of the most important attributes APTA members want to see in their next president. 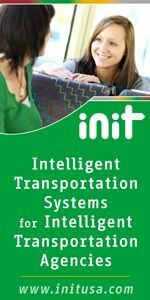 It used an array of outreach methods to collect this information, holding conversations with the Business Member Board of Governors, transit board members, and transit CEOs from large, medium, and small agencies, and APTA staff. The task force gathered additional information from other APTA members through its information page, where APTA members can monitor the task force’s progress as well as provide input directly to it at any stage in the selection process. The APTA Board of Directors, at its March 12 meeting, discussed the desired attributes in depth, providing initial guidance to the task force. That list was then converted to a draft job description. The Board reviewed and commented on the draft job description last week, providing final guidance to the task force as it launched its recruitment efforts. So you think Americans can't live without cheap gasoline? Yet another myth undone. Microsoft rolled out some updates to its Bing for Mobile browser service including real-time public transportation updates for Boston, San Francisco, Seattle, Chicago, and Los Angeles and the inclusion of apps in results when searching on the iPhone. To increase ridership on public transportation, the Young Professionals Committee of the Danville Pittsylvania County Chamber of Commerce is sponsoring a design competition to two new creative bus stop shelters to be built. Join your fellow APTA Bus and Paratransit Conference attendees and local area residents for the second annual “Walk and Roll” through historic downtown Memphis. This accessible-to-all event promotes public awareness of the local disability community while encouraging exercise and wellness. Sponsored by APTA, Memphis Area Transit Authority, and Easter Seals ProjectACTION, the Walk and Roll will be held Tuesday, May 24, from 2:15-3:45 pm. For more information, contact Starleetah Gaddis-Parker.